The ancient city of Marsala has a lot to offer to tourists: from sandy beaches to history, from sport to culture and gourmet experiences. Surrounded by hills and vineyards producing some of the world’s most famous wines, the city of Marsala is rich in elegant baroque buildings and churches, as well as ancient monuments: a tour of the city centre is a great chance to discover some of the most interesting moments of the history of the whole area. Founded by the Phoenicians, the city was named Lylibeo, “The city that watches Lybia”, and its inhabitants are still called “lilibetani” nowadays, while the actual name of the city was chosen by the Arabs (Mars-Allah means “the port of Allah”). The city has become famous all over the world for its delicious “Marsala” dessert wine, and the wine production is excellent in the whole province: combine the annual grape harvest in September-October and the mild climate of this area, and you’ll have the perfect destination for a fall-break holiday choosing one of our Marsala holiday rentals or one of our hand-picked villas in Sicily with pool. 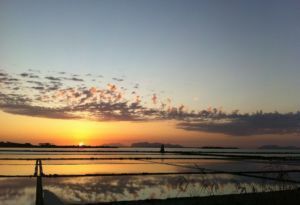 Moreover, Marsala has become an important touristic hub thanks to the Birgi airport located just outside the city borders, and to its port connecting the mainland with the beautiful Aegadian islands. Just outside the city, the area is rich in beautiful naturalistic sites. The Stagnone Nature Reserve is a stunning, valuable protected site where rare flora and fauna are protagonists – together with the romantic salt pans and windmills. Plenty of wonders can be observed here – from pink flamingos and herons to ancient salt pans, built by the Phoenicians, still used nowadays after more than 2000 years. Sunsets are just perfect: sipping a glass of local wine while staring at the shades of red and pink reflecting through the water of the salt pans, with the picturesque silhouette of windmills, is an unforgettable experience. And there’s more: thanks to the always-blowing wind, the Stagnone Nature Reserve is a worldwide-famous destination for kite surf lovers! The Stagnone reserve includes four islands; the biggest one is San Pantaleo, best known as Mothia – the name of the city that the Phoenicians built there during the XII Century b.C., whose ruins can still be observed on the island. This small island is very close to the mainland and is perfect for a one-day excursion among ancient fortresses, walls and city gates, as well as an archaic necropolis and the Sanctuary (“Cappiddazzu”, Sicilian word for large hat) where the famous “Efebo di Mozia” statue was found. The statue can be now observed at the local Withaker Museum. Marsala is not far from the ancient city of Mazara del Vallo, once the most important harbor in the Mediterranean sea, where a typical Arab “casbah” can be still visited nowadays. The stretch of coast between these two lovely destinations is made of never-ending wide sandy beaches in front of the “Sicily channel” and the African coastline, where waters are transparent and clear, and the wind is always blowing.